I'm a big fan of firsts, and yesterday was a first experience I'll never forget. I attended a fashion show celebrating the 60th anniversary of the one and only Value Village (also known as Savers across the rest of the United States). I had no idea what to expect going into the show, having only experienced runway shows online during New York Fashion Week, but being there in the front row was so exhilarating. 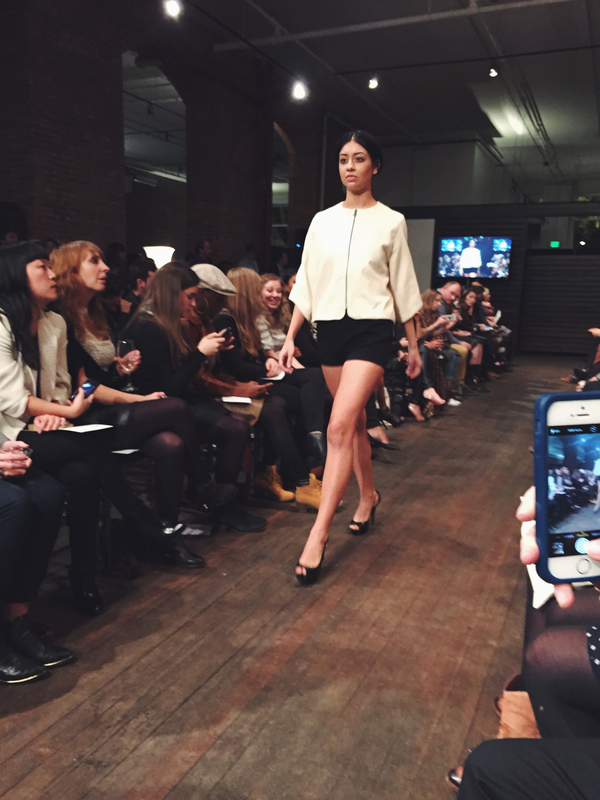 The event was presented by Eco Fashion Week, with local Seattle sponsors like Gene Juarez and Heffner Management. Before the show started, my friend Heaven and I perused the open bar, checked out my swag bag, socialized with guests and snapped a few (awkward) photos at the photo booth. My blogger gift bag had a Theo chocolate bar, an Eos lip balm, Tocca hand lotion and a Value Village water bottle. 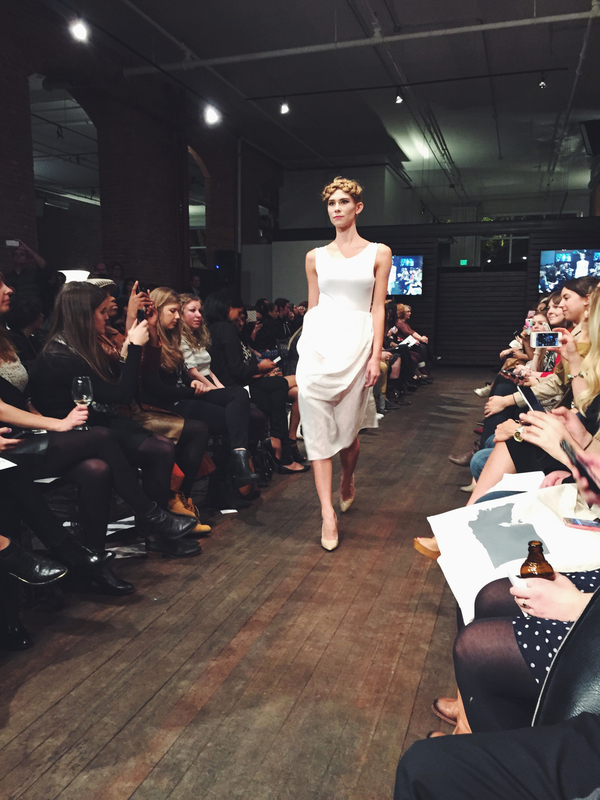 I loved the exposed brick walls and natural wood floors of AXIS studio in Pioneer Square, it was the perfect setting for such a trendy event filled with bloggers, creatives and stylish Seattleites. After we mingled, we took out seats on the right hand side of the runway at seats 26 and 27, providing an advantageous view of the models as they stopped right in front of us to pose for the cameras. The first half of the show highlighted outfits created from 68 pounds of discarded textiles and clothing. The average person throws away this weight of clothes every year, having a detrimental impact on our world's natural resources. Leave it to Value Village and Eco Fashion Week to find designers (like Evan Ducharme and Tammy Joe) that would take this wasteful fact and turn it into an inspirational challenge. I loved that they transformed trash into trends. From black and white ensembles to bold color blocking, it was amazing to see every new trend represented by materials of old. The second portion of the event was a Thrift Chic Fashion showcase that highlighted the unique style of every decade that Value Village has existed. Starting with the 50s and ending with the 2000s, each designer captured astonishing yet attainable looks using secondhand clothes. Seeing these creative couplings of clothes reminded me of my thrift shopping adventure earlier this year and how much I enjoyed finding value in something vintage. I left the event with the satisfying affirmation that being fashionable and being eco-friendly is completely possible and actually, really fun. Now that I'm armed with a free $20 gift certificate to Value Village, I'm ready to embark on another eco-fashion adventure!